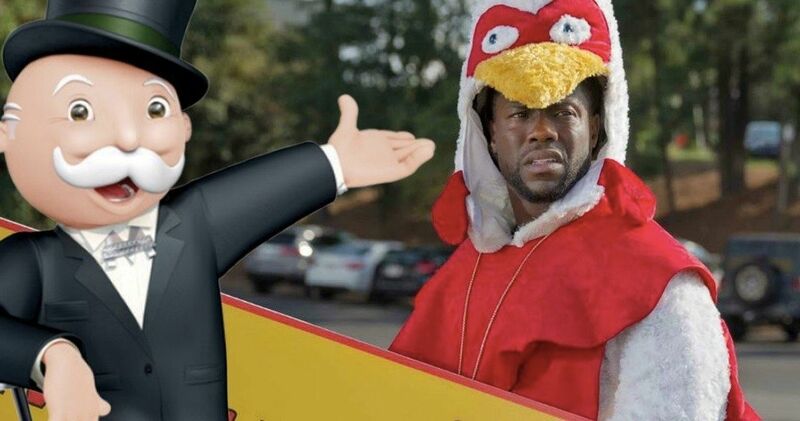 The Monopoly movie has new life, thanks to Kevin Hart. Paramount Pictures and Hasbro are moving forward with the long-gestating big screen adaptation of the very popular board game and they’ve tapped Hart to star in the lead role. Should the project actually move forward in its current form, Hart will reunite with director Tim Story, who he worked with on both Ride Along movies. They’ve proven to be a financially viable duo in the past, making this a tantalizing package deal for the studio. According to a new report, Both Kevin Hart and Tim Story are in final negotiations with Paramount and Hasbro, who are producing Monopoly through their Allspark Pictures production company. Should the deal close, it will give the project a fresh start and perhaps its best shot at actually going in front of cameras. Development on the movie has been going on for the better part of a decade, with several different filmmakers and stars attached at various points in time. Even Alien and Gladiator director Ridley Scott was attached to produce at one point, as strange as that may seem. At the present time, plot details for the movie are being kept under wraps. A previous version of the story would have seen a young man from the game’s lower-level location Baltic Avenue on a journey to make a massive fortune. No writer has been set for Monopoly in its latest version, nor has the studio locked down any actual production dates. As it is, the project appears to be in its early stages. However, should Kevin Hart and Tim Story close their deals, things could get moving fairly quickly. Kevin Hart has proved himself to be a very bankable star, with his most recent movie The Upside making a surprise debut atop the box office last weekend. But the comedian and actor has been embroiled in controversy as of late, given what happened with his Oscars hosting gig, which he surrendered after a series of anti-LGBTQ tweets and statements resurfaced online. Hart has been criticized for how he handled the situation, but he’s made it clear it’s in the past and he’s moving on. Part of that will involve him heading off to shoot Jumanji 3 next month and, if all goes well, locking down a deal to star in Monopoly will also help him put the situation in his rearview mirror. As for Tim Story, he’s delivered hit after hit for much of his career, having helmed the first two Fantastic Four movies for Fox, in addition to several of Kevin Hart’s theatrically released comedy specials and Barbershop. Story most recently directed the new Shaft sequel, which arrives this summer. Monopoly does not yet have a release date. We’ll be sure to keep you posted as any further details about the project make their way online. This news was first reported by Deadline.